Early in the morning of May 9, news of malfunctioning vote counting machines (VCMs) have been reported in several areas nationwide. These incidents caused delay in voting by as much as six hours in some areas, with lots of voters expressing dismay over the delay. Some voters got tired of waiting for the VCMs to get fixed and just went home without voting. The Commission on Elections (COMELEC) has responded by extending voting hours by one hour or until 6 P.M. in precincts where the VCMs have failed. COMELEC Chairman Andres Bautista said in a press conference that voters within a 30 meter radius of the precinct will be given time to vote. There are about 2000 problematic precincts scattered throughout the country wherein voting was extended by an hour. According to COMELEC, about 150 VCMs have been replaced. There are reportedly 5000 spare VCMs that can be used for units that will malfunction. About 92500 VCMs were deployed all throughout the Philippines for the national elections. The malfunctioning units represent only .16% of the total, but still, the incidents have deprived thousands of Filipino citizens from casting their precious votes. As to when "automated" counting of votes in the country will be 100% malfunction and error-free is still a question mark. When can Filipinos experience a better electoral process wherein they don't have to bake in the sun for hours because of malfunctioning VCMs? 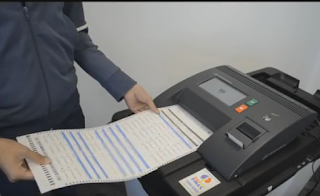 Elections in our country have been using vote counting machines since 2010. It's been six years since then, and up to now there are still vote counting machines that are "lemons". Will elections 2019 be any different?